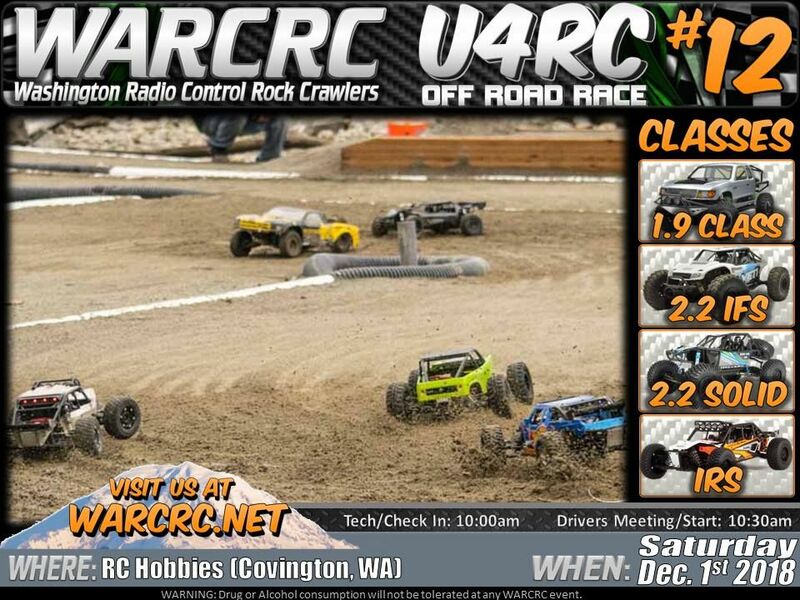 The WARCRC U4RC Race #12 is this Saturday Dec 1th at the Covington Wa offroad track. The track is located right behind the RC Hobbies Covington hobby shop and the store opens at 10am if you need any parts or etc. We run 4 different classes with 2 heats and then mains after that. View full details below. **BONUS** 2.2 Unlimited Class (no points/fun run) - bring your racer that doesn't quite fit in a class - Let's Race! There is a $5 track fee, per person for this location by track owner request. There are four classes, 1.9 Class, 2.2 IFS, 2.2 Solid and IRS. It takes a minimum of 3 trucks to make a class or the class will be combined into an equivalent tire size class. After a driver has completed a race, the driver has to Corner Marshal the next race. Each race will be a total of 4 laps and each race is limited to 4-5 racers. Each class at the minimum will run two Heat Races and an A-Main. A class with 5+ drivers will have a B-Main and a class with 8+ drivers will get a C-Main.